One of the most hyped leagues this year. Many brilliant cards on FUT and League by itself really interesting to watch. Huge title race between BVB and Bayern, race for Champions League football between 6 clubs and race towards survival too. This prediction was made based on stats, ratings on Kicker and League position of the team currently, based on 3rd of April. There will be some changes in the end of the season, of course. 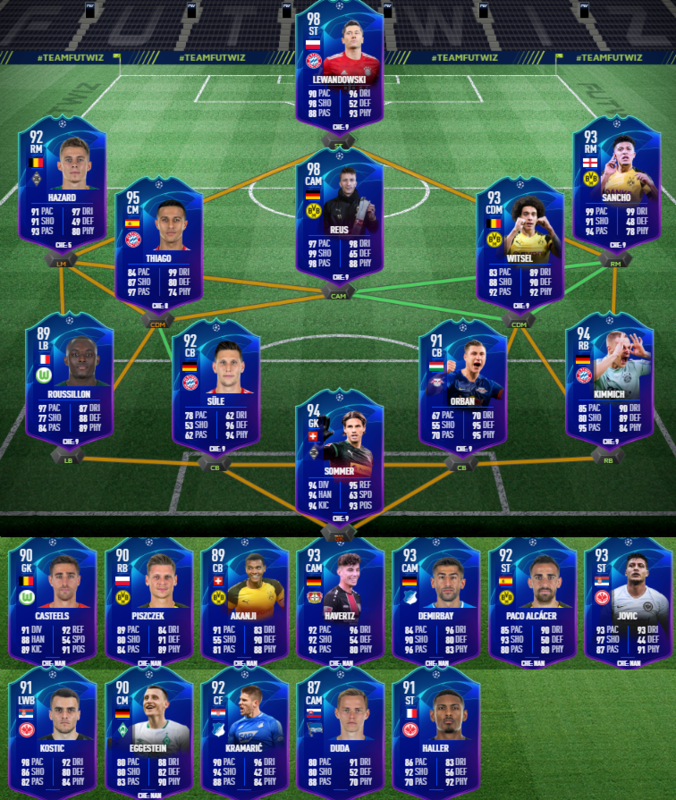 Also take in consideration that Bundesliga TOTS might be decided by fan voting again, so there would be even more changes. There are 2 main candidates for me this season: Yann Sommer and Koen Casteels. I wouldn’t even consider many goalkeepers, because there are a lot of teams that didn’t settle on one goalkeeper and also Keepers, that have good stats conceded a lot of goals, because they play in lower placed teams (Esser from Hannover, for example). Yann Sommer is probably one of the Headliners of the season in Bundesliga and carrying Borussia Monchengladbah a lot this year. Koen Casteels has been good for Wolfsburg. That team always struggled at the back for the past few years, but this year, surprisingly to me, Wolfs started to perform well. And Casteels one of the main reasons of that. Even though they conceded already 41 goals, without him it’d be much worse. I wouldn’t really suggest any alternatives, but Romain Burki might be possible candidate. On to defenders we go! Full backs one of the more interesting positions in the Predictions, I think. Because there’re lack of the good fullbacks in the league currently in game and TOTS might fix it. Jerome Roussillon. Jerome Roussillon. And again. Yeah, you got me. Jerome really deserves a spot in TOTS. He’s the most consistent left back in the league. 2 goals and 3 assists, a lot of clean-sheets and probably one of the signing of seasons in Bundesliga. Still to this day, do not know how they bought him for so cheap. 2nd choice is Filip Kostic. Another bargain of the season. This one is from Eintracht. Moved from relegated HSV in the summer and started playing as LWB in 3-4-1-2 formation and after New Year he started performing even better. 5 goals and 8 assists to his name, but his stats are affected by the fact that he’s playing more attacking position. You can compare him to Caligiury from Schalke from last season. 3rd choice is Nico Schulz. Great player for Hoffenheim and got a call-up to national team. He’s also playing some sort of LWB, not LM. He got 1 goal and 3 assists and overall the best Hoffenheim defender this year. I’d say Kostic deserves it more than others, because he’s a bit different type of defender. But I wouldn’t be surprised if Halstenberg or Schulz would get into TOTS. Right back position is probably easier to choose. 2 clear favorites for me: Joshua Kimmich. He’s playing this season for Bayern in a bit strange way: He’s playing both CM and RB position. From Right-back position he recorded 10 assists and 2 goals. Joshy is always good, but sometimes he’s a bit inconsistent. He’s becoming one of the leaders of the Bayern. 2nd choice would be a little bit harder, so I’d choose between Lukasz Piszcek and Lukas Klostermann. Both would be deserving choices. Lukasz Piszcek is from the old-army of players and Klostermann is young talent. Piszcek recorded 1 goal and 6 assists and his TOTS would be really good. He’s got a highest average ratings out of Right Backs, so I wouldn’t be surprised if we’ll see him in TOTS. Klostermann got 3 goals and 1 assist. A bit different, but he’s been really good player. Again, I repeat myself, but Leipzig defense has been really solid this year. And the hardest position in my TOTS prediction: Center Backs. Boy, there were a lot of average CB performers this year. It was really hard to choose even 3 CBs, I can’t imagine more than 4 CBs to be in TOTS. Let’s cover 2 players that I think 100% will get in TOTS: Niklas Sule and Willi Orban. Orban is already 3rd defender from Leipzig. Yes, their defense is a good one. Yes, I’m replying myself. Again. Orban is the best defender this year in Bundesliga, he also managed to score 4 goals. Niklas Sule is my 2nd choice from Bayern. I should say that he’s the best center back from 3 main guys in Bayern: Hummels, Boateng and Sule. Hummels + Sule starting to form decent pair after New Year, but before that it was really bad for Bayern. Boateng and Hummels were making a lot of mistakes and Sule tried to carry them as hard as possible. So, overall, he deserves TOTS in my eyes, more than anyone else, IMO. 3rd and 4th choices are hard. I’d place on the bench: Manuel Akanji. If he wasn’t injured for a lot of games – he’d be my undisputed choice. But when he played – he was amazing for BVB. 4th choice is Martin Hinteregger. He switched teams in the winter. And he managed to perform in both teams. In Frankfurt he made their defense much better and they haven’t lost a game in 2019 yet(watch me curse them). A lot of choices for few positions, but as always let’s start with guaranteed choices: Axel Witsel. Probably signing of the season in Bundesliga. Not many people believed in him, but after China he performed amazingly well for BVB. Recording 3 goals and 1 assist, but mainly controlling games alongside Delaney. Also, he has average pass success rate of 93,1%. That’s amazing result. Probably the most deserving midfielder to get into TOTS. His partner in my main TOTS: Thiago Alcantara. One of the more interesting players in Bundesliga: Without him Bayern averages less than 1 point per game, while with him it’s more than 2. Yes, he’s that important for Bayern. He’s playing as 2nd defensive midfielder with different partners, but performs with anyone. Kai Havertz is more of an attacking choice, but his role is still in midfield, so he deserves to be here. 10 goals and 3 assists. Him or Brandt will be in TOTS 100%. Depends on the finish of the season, but currently Havertz rated higher. Kerem Demirbay is another choice. He’s unreal player in real life and many people under-rate him highly. He’s probably the best Hoffenheim player this season and also he has 4 goals and 4 assists to his name. Most of the time he’s playing as center midfielder in 3-5-2 formation. Maxi Eggestein. Amazing breakthrough season for German youngster. 5 goals and 3 assists, mostly playing as left-center midfielder in 4-3-3\4-3-1-2 formation. I think he’s one of the few players from Werder that deserve it. Fun fact: Werder is the only team in Europe that scored at least one goal in every game of the season. Ondrej Duda. 10 goals and 2 assists from CAM Spot. 4 goals from playing at CM, but yeah, he deserves TOTS and no one would convince me otherwise. The best Hertha player this season (okay, Grujic is good too, but he hasn’t played that many games). Wouldn’t be surprised, if there’s fanvoting, to see James Rodriguez in TOTS. He often plays really well, but he doesn’t play that often. Still he has good stats and has a chance to be in TOTS. That’s us done with Midfielders. Wait, you telling me I forgot someone? Marco Reus falls into “Marco Reus” category. He’s playing amazingly, and he’s playing everywhere for BVB. He’ll get one of the better TOTS in FUT history. This card will be probably 98 or 99 rating. 15 goals, 6 assists. What a season, Marco. What a season. Wingers are hard for Bundesliga, just because… not many Bundesliga players playing with Wingers. Only few teams, exactly. So I only have 2 choices: Thorgan Hazard and Jadon Sancho. Both were unreal this season. I shouldn’t even describe them as both of them will get 100% TOTS. Jadon Sancho got 8 goals and 13 assists. Thorgan Hazard got 9 goals and 9 assists to his name. Serge Gnabry is the only one LM that has a chance to be in TOTS. Even though he plays usually RM, he often played LM, so wouldn’t be surprised to see him being included in TOTS at LM. And the last position is Strikers. Ugh. There’re a lot of Strikers to choose from. And I mean a lot of them. Luka Jovic. Yes, even ahead of Lewandowski. Insane season from Serbian players: 16 goals and 5 assists, many clubs in the world want him in his club. 100% TOTS and his card would be insane in FUT too. Robert Lewandowski. Oh gosh, if only Lewa would be more clinical. He still managed to score 19 goals and got 7 assists, but if he would be a little bit more clinical, we’d be looking at already 25+ goals this season alone. Still will get insane TOTS card because he’s that good. Sebastian Haller. Partner in crime for Jovic. 14 goals and 9 assists and one of the best players in the Bundesliga. If Bayern wants a perfect replacement for Lewa – they can look up to this guy. He’s that good. Somehow he still doesn’t have an IF card in FIFA19. Paco Alcacer is another player from BVB. Paco – super sub. Scored 16 goals in 24 appearances, 12 of those were from bench. And many of those goals came after 90th minute. Another player from Hoffenheim is Andrej Kramaric. Not your unusual striker, playing sometimes in midfield, often scoring from CM spot in 3-5-2. Yussuf Poulsen is strange choice. Yes, he scored 15 goals. But often he scores 2 goals and then goes quiet for 3-4 games. Then repeats, then again goes quiet. Would be interesting to see his TOTS just because his stats would be insane. And the last one is Max Kruse. Kruse probably the best Bundesliga player since February, scoring 6 goals and recording 3 assists in March alone, but overall he “only” has 10 goals and 8 assists to his name. Again, depends on a finish of the season and Werder Position in the league.